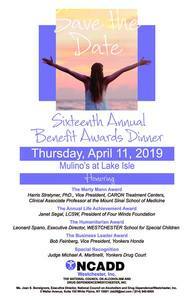 Please join NCADD, Westchester, Inc., (The National Council on Alcoholism and Drug Dependence) on Thursday, April 11, 2019 for our 16th Annual Awards Dinner at Mulino’s at Lake Isle. We will be honoring Harris Stratyner, PhD., VP of CARON Treatment Centers, Janet Segal, LCSW, President of Four Winds Foundation, Leonard Spano, ED, WESTCHESTER School for Special Children, Bob Feinberg, VP of Yonkers Honda and Judge Michael A. Martinelli of Yonkers Drug Court. Event and ticket information is available on our website at www.ncaddwestchester.org or call our offices at 914-949-8500.